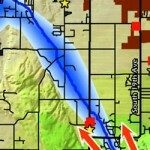 After the early warning system has detected a failure, the community is then warned of the situation. 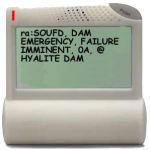 A variety of notification methods are utilized to relay the warning and it is encouraged that individuals ensure they have the ability to receive notifications through multiple methods. 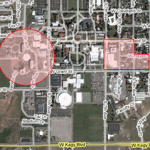 By making sure they can receive notifications through multiple routes, individuals will ensure their ability to receive notification as early as possible. Many of these systems require some form of action on the individual’s part to receive the notification. Please read below for information on each system. The Gallatin County Community Notification System is powered off of the information provided by telephone companies that enables the 911 system to know where you are calling from. When using CNS we designate an area to be notified, then start calling the phones in that area with an automated message. The only phones that we automatically have in this system are land line telephones. Cellular telephones and Voice over Internet Protocol (VoIP) phones are not automatically added to the system since vendors do not know where they are located. Individuals using these devices are encouraged to register their non-land line phones online and associate them with their home address. By registering your phones they then become associated with an address and can be called by CNS. To learn more about CNS in Gallatin County, please visit the Community Notification System page. Only phones that have been registered by their owners are capable of being notified by this method. This feature is now contained in the Community Notification System outlined above. 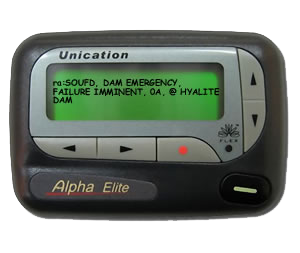 More information on the NOAA Weather Radio can be obtained at https://www.readygallatin.com/?page_id=2110. Weather Radios in Gallatin County should be configured using the Gallatin County SAME Code of 030031. 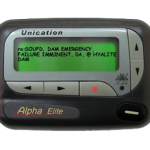 The Emergency Alert System is a national system that allows federal, state, and local officials to send emergency messages to the public through local broadcasters. While the redistribution of these messages by broadcasters is not mandatory, most local broadcasters are active supporters of the Emergency Alert System. 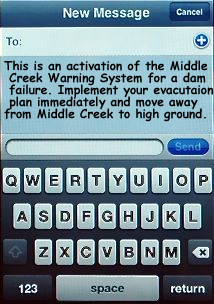 In the event of a dam failure at Middle Creek you would hear, “This is an activation of the Middle Creek Early Warning System for a dam failure. 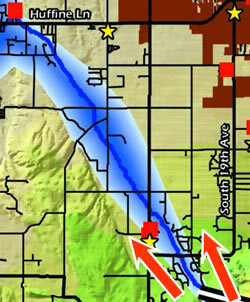 Individuals in the inundation area are to implement their Middle Creek Evacuation Plans immediately. 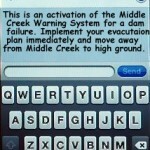 Individuals should move away from Middle Creek to high ground. Additional information will be provided when available at ReadyGallatin.com.” This will be an audio message heard over local television and radio stations. 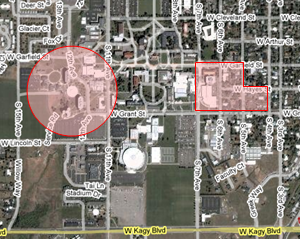 It is very likely that it will also appear as a scroller across the screen of local television stations. The biggest problem with the Emergency Alert System is that an individual must be listening to a local radio station or watching a local television station to receive the alert.